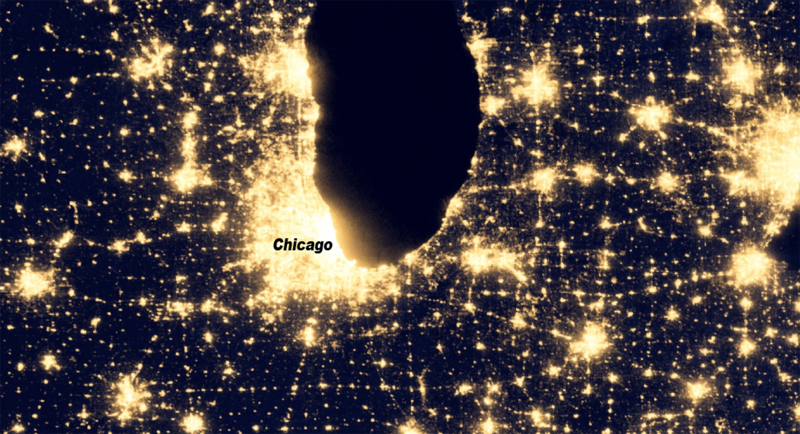 Night-lights imagery by NASA's Earth Observatory shows Chicago's light pollution at night. Click to explore the map. Chicago’s celestial landscape is bright and beautiful, but it’s virtually invisible because it’s obscured behind the orange glow that emerges from the city’s streetlights and buildings each night. This obscured sky has hundreds of thousands of stars, dotted with bright travelling planets, crisscrossed by satellites and burning meteors. To see that sky, you need a dark sky, and in Chicago — a city of stage-lit skyscrapers, sprawl and sodium streetlights — it just doesn’t get dark enough to see more than a handful of the brightest stars and planets. As the night sky fills up with more artificial light from increasing development and glare from unshielded streetlights, more people are forgetting what darkness even looks like. Or, worse, they never experience it at all. What are the best spots in Chicago or the suburbs to stargaze? To Paula, moving to Chicago not only meant she had to give up seeing stars, but also the feeling that goes along with it: She misses the part of herself that had been filled with wonder just by looking up at night. We asked astronomers and stargazers to tell us where Chicago’s good stargazing spots are. They all told us the same thing: nowhere. Not in the city or in Chicago’s near suburbs. But, some spots are better than others, and you’re better off getting as far from the city as possible. Adler astronomers and members of the Chicago Astronomical Society promised visiting a few of their favorites is worth your time. (Assuming there are no clouds, of course!) We’ve listed their suggestions below, from least-worst to OK. Consider the list your invitation to catch a bustling display of stars, constellations, meteors, and galaxies you’re denied each evening! *Note: Our recommended stargazing spots fall on the Bortle Scale, which measures a sky’s darkness and light pollution. In this scale, a 1 is the darkest theoretical sky, and a 10 would render stars invisible. Why: It’s slightly east of the Loop, and that slightly cuts down the light pollution. How: Point your eyes or telescope east over Lake Michigan. The sky will be a tad darker than it would if you were facing the glow of downtown. Other suggestions: Adler Planetarium staff and other volunteers organize stargazing meetups through their ‘Scopes in the City program, where you can gaze at Chicago’s night sky through telescopes in various places around the city. For indoor stargazing, Adler’s Doane observatory has the largest telescope in Chicago. (It’s becoming more accessible to the public as renovations are completed.) The University of Chicago’s Ryerson Observatory is another option, but call in advance. Why: It has few lights! This 77-acre nature preserve lies along the Lake Michigan shoreline, 25 miles north of Chicago. It officially closes at sunset, but the Chicago Astronomical Society sometimes gains permission to host stargazing meetups there. Other options: For indoor stargazing, Northwestern University’s Dearborn Observatory is open to the public on Fridays. Why: This park promises some of the metro region’s darkest skies; its 21,000 acres of wetlands and dunes are mostly unlit, and the darkness of Lake Michigan lies just north. It’s within an hour’s drive of Chicago and is accessible by public transportation, too, though a commuter train trip can take twice as long as a car ride. Under the right conditions, many stars are visible and you can clearly see the hazy patch of the Milky Way above the horizon. How: The park is open until 11 p.m. To stay later, consider camping, which is possible year round. The park holds special stargazing events, some of which involve sleep-overs on the beach. Where: Ferries start from Milwaukee or Manitowoc, Wisconsin. From Milwaukee, catch a night ride with the Lake Express that cuts right across Lake Michigan to Muskegon. The S.S. Badger departs from Manitowoc. Why: The trips can take approximately 3 ½ hours. About halfway through, you’ll see the best stargazing in the area! The Milky Way is bright enough to cast shadows onto lighter objects. Some stars appear red or yellow, others blue, while others are white. How: Head to the top deck about 90 minutes into the voyage. The ferries move quickly, so be warned that the pinnacle of darkness doesn’t last long. Bring layers because it gets windy! Can we suggest a sailboat? If you have a boat (or have a friend with one), you’ll be surprised to find how many stars you can see even just 10 miles due east of the city and northern suburbs. While looking back at the view of Chicago’s skyline could be tempting, give yourself about 15-20 minutes to gaze out into the darkness to adjust your eyes, too. Here’s a look at our own trip, and be sure to listen to our audio story which takes place on board! Logan Jaffe is Curious City&apos;s multimedia producer and Jesse Dukes is Curious City&apos;s audio producer.